In its Moss upholstery range German seating manufacturer COR presents its most comfortable model to date. The design by Markus Jehs and Jürgen Laub resembles a floating cushion with multi-layered upholstery inviting you to sink deeply into it. It's the inner values that matter! People tend to be divided about details. Some regard them as heaven sent, for others they're the work of the devil. But no matter which attitude you support: it's the refinements that give something true character and make it stand out from the crowd. The Moss upholstered seating range from Cor shows that visual qualities are are by no means the 'only' important features here. 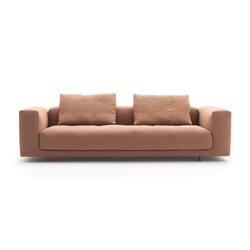 With a seat depth of 110 centimetres the design by Jehs + Laub is extremely spacious - an effect that is all the more accentuated in large rooms. 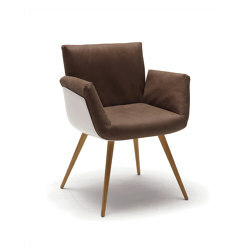 Compared to Conseta - since the 1960s the best-selling seating range of the manufacturer from Rheda-Wiedenbrück in East Westphalia - this represents a noticeable increase of 25 centimetres. However, increasing seating comfort is by no means just a question of proportions. "Anyone who sits down on Moss should be able to relax immediately and almost float," is how Leo Lübke, Managing Partner of Cor, defines the goal. To achieve this, the range of seating features real down filling. 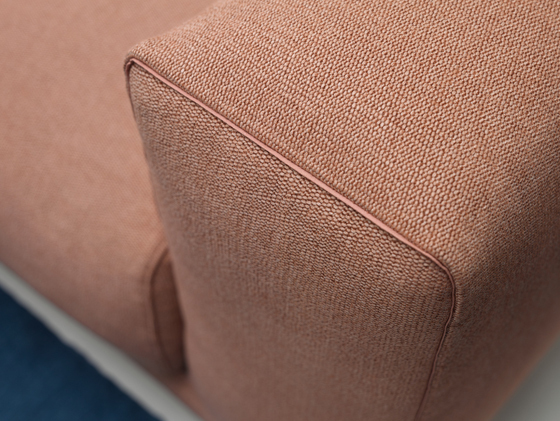 While the cushions of the backrest are filled with pure feathers, the structure of the seat cushions is reminiscent of a sandwich: a down layer rests on a foam core. 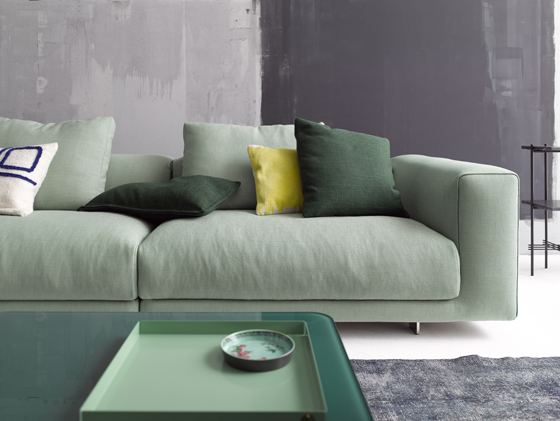 Above this a layer of cotton ensures that the upholstered cushions have an undisturbed, even surface and a welcoming appearance. "If we filled the seat cushions with pure down, there would be so little support that you'd immediately find yourself sitting on the floor," says Christian Erpenbeck. 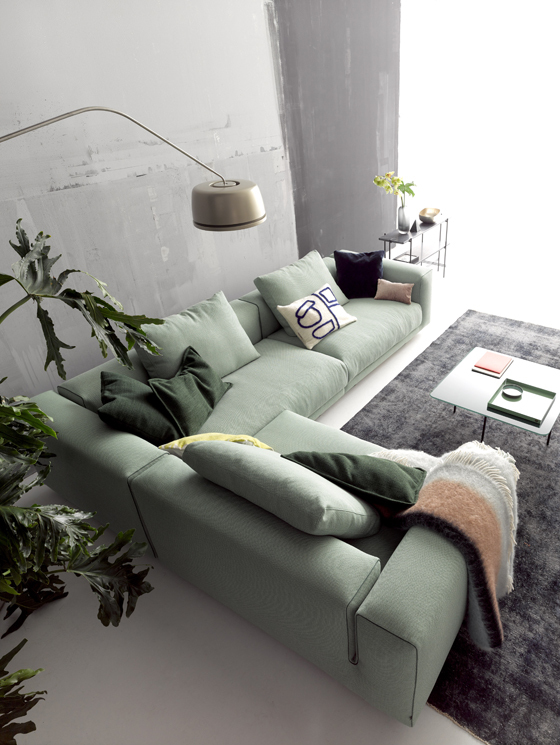 Cor's product manager was responsible for the entire process of developing the sofa, and was also involved in determining the internal combinations of material. 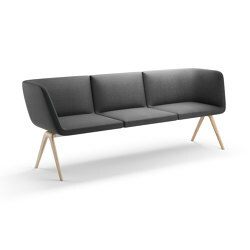 The division into individual zones plays a particularly important role in the creation of comfort, with a foam core that varies in density in order to create a pleasant seating sensation. The seat cushions are firmest at the front and become softer towards the back. Even if this gradient remains hidden from the eyes, the effect can be clearly felt when sitting down. 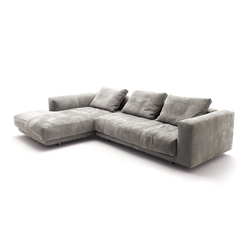 You literally sink into the upholstery, while the back cushions provide firm but gentle support. The front of the seat cushion plays a special role. "It's not uncommon for people to sit on the edge. That's why we have applied a very firm, wedge-shaped strip of foam, so that you don't sink right in, but always remain at the same level," explains Christian Erpenbeck. 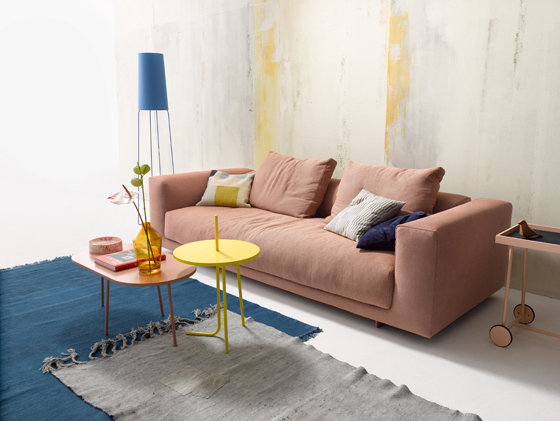 Another advantage of this firm edge is that it prevents the sofa from losing its shape visually, and and ensures that it retains its original form even after many years of use. Details also play an essential role in the external appearance of Moss. Allround piping emphasises the cube-like contours and can, on request, add a finishing touch in different colours. Vertical slits are also provided at the rear and on the sides of some corner elements. Their task is to break up the look of the backrest and create a more informal appearance. 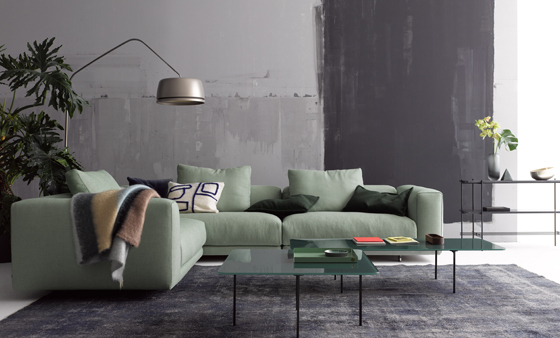 "This point is important so that the sofa doesn't dominate the entire room as a solid, closed wall," explains Christian Erpenbeck. 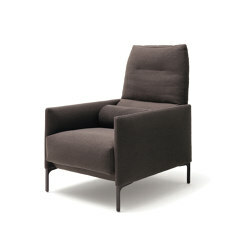 The low backrests, which merge directly with the armrests, counterbalance any suggestion of bulkiness. Their height is basically much too low to support the back. 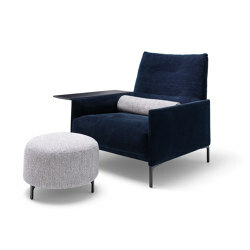 This is compensated for by the down-filled cushions, which extend well beyond the backrest and give the sofa a relaxed and informal appearance. The horizontal aspect is emphasised, in combination with the increased depth of the seat. 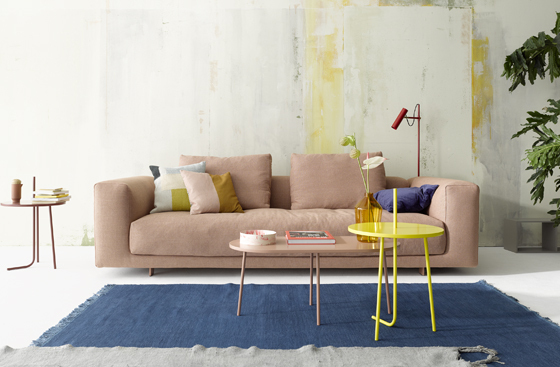 As a result the sofa doesn't act like an intrusive object in the room, but instead defines a level raised above the floor – promising invisible yet all the more striking seating comfort. In this case, the devil is certainly not in the detail.